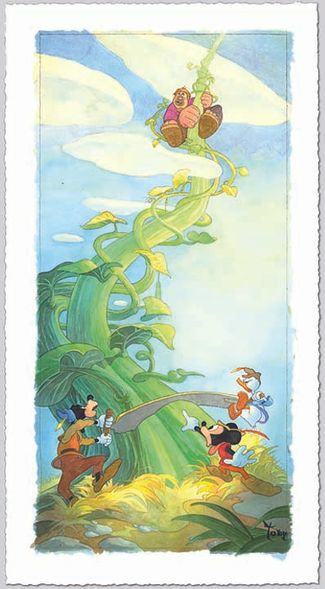 Toby Bluth Artist Signed Limited Edition Hand Deckled Giclee on Paper:"Mickey and the Beanstalk"
About the Artist: Walt Disney was a man who had an amazing ability to inspire other people to remarkable creative achievements. Toby Bluth happens to be one of those shining gems of talent that to this day draws inspiration from the life and work of Walt Disney. Starting with Snow White and the Seven Dwarfs then continuing with Pinocchio, Fantasia, Dumbo and Bambi, the first five feature length films to come out of Walt Disney Studios, according to Bluth, are the five gems in the crown of animation's royal history. Just as those five films marked Walt's grand entrance into feature length storytelling they, quite appropriately, set the stage for the first five limited edition giclée's in Bluth's Disney Fine Art portfolio. Infused with all the depth, texture and richness of Toby's original watercolors these fine prints will be enjoyed for generations, very much in the spirit of the timeless classics that inspired them. Description: All Prints are sale priced everyday! Professionally Frame any print from our dealer gallery starting at an additional $199 and receive free shipping! Click here to view the framing options. Availability: Print only orders usually ship in 3-9 days. "Custom Framed" products are made to order by craftsman, so additional time is required. Please allow 3-4 weeks for delivery. No thank you, I just want the print. 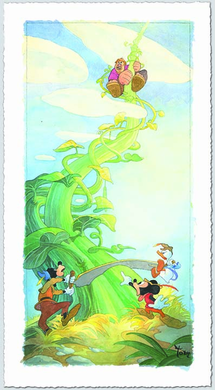 Copyright 2000-2019 Gallery Direct Art TM. All Item pricing and availability is subject to change. Sizes are approximate. All images are copyrighted by their respective publishers.